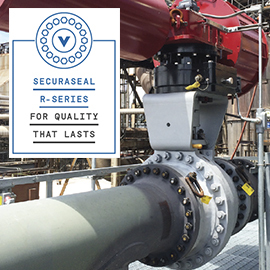 (Houston, TX) Velan introduced the all new Securaseal R-series cast metal-seated ball valve at Valve World Expo in Houston, Texas. The new R-series cast product line leverages Velan’s extensive severe service technology and places it in an optimized package suitable for most processes with fluid slurries and high temperatures. Optional easy-to-automate mounting pad with severe service drive-train. This product line has been carefully engineered and tested, both in Velan’s own labs and in the field. “Our new platform for metal-seated ball valves has been engineered for weight and torque competitiveness, while ensuring components will perform over an extended service life. Some of the work is hard to see, but ultimately we’ve made many optimizations based on our own field experience and the latest standards, resulting in a valve that meets Velan's high severe service standards, at a competitive price. In addition, this product comes with a vast material and coating selection that can be tailored to tough operating conditions such as high-pressure oxygen service, slurry-carrier applications, and high-pressure steam." said Valeska Chwoschtschinsky, Product Specialist for Securaseal. Customers can get more information about this product and request Velan's help in matching a metal-seated ball valve technology to their process at velan.com or contact us to book a technical meeting at + 1 514 748 7748 x 5605 or valeska.chwoschtschinsky@velan.com.